The Bora are an indigenous tribe of the Peruvian, Colombian and Brazilian Amazon, located between the Putumayo and Napo rivers. The Bora speak a Witotan language. In the last forty years, they have become a largely settled people living mostly in permanent forest settlements. In the animist Bora worldview, there is no distinction between the physical and spiritual worlds and spirits are present throughout the world. Bora families practice exogamy. The Bora have an elaborate knowledge of the plant life of the surrounding rainforest. Like other indigenous peoples of the Peruvian Amazon, such as the Urarina, plants (and especially trees) hold a complex and important interest for the Bora. Bows and arrows are the main weapons of the Bora culture used in person to person conflict. The Bora are very divided and politically unorganized. The Bora have guarded their lands from both indigenous foes and outsider colonials. Around the time of the 20th century, the rubber boom had a devastating impact on the Boras. The tribe's ancestral lands are currently threatened by illegal logging practices. The Bora have no indigenous reserves. The Bora native community consists of about 3,000 native-speakers almost all living in Peru (about 2000 individuals) and Colombia (about 1000 people), although several Bora villages exist in Brazil. Unfortunately, the Brazilian Boras no longer speak their native language having been largely assimilated into the Brazilian culture. The Bora language is closely aligned with Huitoto (Witotan). The Bora tribe is divided into different clans, typically represented by an animal. They paint their faces with different designs with huito (Genipa americana), depending upon their clan. Intermarriage with the same clan is prohibited, thus preventing interbreeding and genetic aberrations within small communities. Traditionally, the Boras dance using large (six foot) batons that they pound in unison on the ground as they dance. The batons typically have shells attached to them that add to the musical harmony. They also use Manguaré drums, which have different forms, depending on whether they are male or female, and are used in some Bora ceremonies. They also manufacture traditional bark cloth, made by pounding the bark of a palm tree. The Boras peel strips of bark from the tree and pound it with a wooden hammer. After they wet and pound it until the outer bark disintegrates, only the inner bark is left. The inner bark is the natural fiber used for traditional Bora clothing. The bark clothes have a coarse, inflexible look and the texture of burlap. The bark clothing is coloured with natural dyes. Yellow colours are obtained from a ginger plant and black from pressed green fruits of the huito tree. The huito liquid is clear when first painted, but later turns black as it is oxidized by the air. In addition to bark cloth, the Bora Indians have bags that are woven from chambira, a fiber obtained from a palm tree. The fibers used in these bags are typically dyed using native plants and the bags really are hand-made works of art. 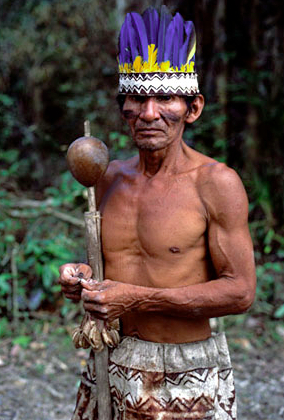 The Bora tribe has managed to retain much of their knowledge of medicinal plants. A good example is the coca plant (Erythroxylum coca) which plays an important role in the diet and traditional medicine of the Boras. As in the Andes Mountains, coca leaves are consumed to provide essential nutrients and is an integral part of their diet. Similar to the Andes, the consumption of coca allows individuals to work for extended periods without exhaustion. What is different from the Andes is the manner in which the Bora Indians process the coca. They do not chew the raw leaves as they do in the mountains. Instead, they dry the leaves over a fire, place them into a sack and pound them into a very fine powder. This powdered coca typically is not taken alone and traditionally a tobacco mixture is blown into one’s nostrils before the coca powder is placed in one’s mouth. Around 1900, the Amazon rubber boom changed the ways of the Boras forever. This period was disastrous for the Bora communities of the Putumayo as the Peruvian rubber corporations enslaved the Boras and forced them to harvest the latex from wild stands of rubber trees. Large numbers of Boras were wiped out during this period. Before the rubber boom, the Bora indigenous population was estimated as over 15,000 individuals. Some years later, following Peru's disastrous loss of the border war with Colombia in the 1930’s and the ceding of territory north of the Putumayo, many Boras were evacuated to their present communities near Iquitos. By the 1940’s the total population of Bora natives had dwindled to fewer than 450 people.